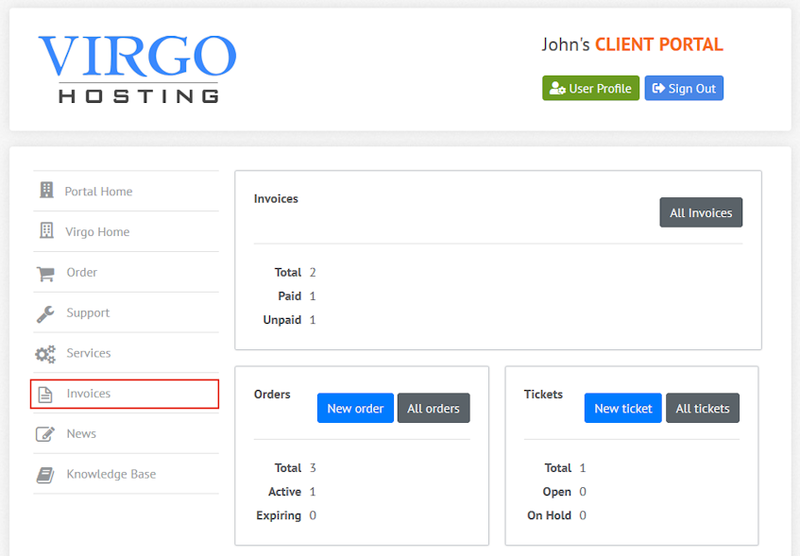 The Invoices interface in the Virgo Hosting Client Portal lets you view and pay your invoices. In the client portal homepage, click 'Invoices' button in the menu. If you're accessing the client portal from a mobile device, the menu will be accessible through the 'MENU'icon. The list of invoices table in the client portal invoices interface lists your paid and unpaid invoices and allows you to manage them. Click "Unpaid" button on top of the invoices table to list your unpaid invoices. "Title" column of the invoices table shows the title of your invoice. "Issue Date" column of the invoices table shows the date the invoice was issued. "Due Date" column of the invoices table shows the due date for the invoice. "Total" column of the invoices table shows the total value for the invoice. Click "Pay" button to pay the invoice. Please refer to the following sections of this document for details. Click "Paid" button on top of the invoices table to list your paid invoices. "Paid at" column of the invoices table shows the date invoice was paid. Click "View" button to view the details for the paid invoice. Find the invoice you'd like to pay and click "Pay" button. A new page will open. In this page, you will find the details of the invoice, as well as payment options. Select the payment method from "Payment methods" section. Click "CoinPayments" logo if you'd like to pay with cryptocurrencies. You will be redirected to the payment interface in CoinPayments website for payment. Click "2CheckOut" logo if you'd like to pay with with your credit card. You will be redirected to the payment interface in 2CheckOut website for payment. Find the invoice you'd like to view the details of and click "View" button. A new page will open with the invoice details.